Above photos from left: Prospector and burro at 3 Valley Gap, near Revelstoke, BC;3 Valley Gap Lodge; Summit of Rogers Pass on Trans Canada Highway in the Rockies. Luxury rail operator Rocky Mountaineer was named World�s Leading Travel Experience by Train at the 2011 World Travel Awards, marking six years in a row the company has earned the title. Travelling across Western Canada to world-class destinations like Vancouver, Whistler and the Canadian Rockies, Rocky Mountaineer bested such legendary train tours as The Royal Scotsman, South Africa�s Blue Train and the Eastern and Oriental Express. The World Travel Awards recognizes excellence in travel, with winners chosen by more than 200,000 industry professionals and travellers worldwide. This year�s ceremony took place in Qatar in early 2012. Rocky Mountaineer�s portfolio of accolades also includes awards from National Geographic, Travel + Leisure and Outsidemagazines. Read Rocky Mountaineer�s release here. For two active decades we lived and worked in Calgary,Alberta in the foothills of the Blue Canadian Rockies. Each time our spirits needed a lift, or one's system craved a shot of oxygen or adrenaline, it was a simple case of hopping behind the wheel and pointing the car directly west. During the trip, someone would insert an audio tape of John Denver's Rocky Mountain High, and the picture would be complete. In less than one hour, those towering icons, Mount Norquay and Rundle would signal our arrival. Our family and I never tired of the Banff-Lake Louise area -- fishing and camping at Lake Minnewanka, mineral baths at the Upper Hot Springs for starters. Golfing on the Banff Springs course, where you teed off across the Bow river, was a favorite. In winter, it was a frosty wonderland far grander than anything depicted in print and on film. At an earlier period I spent and entire summer in the saddle, trekking and mountain climbing in the Yukon with the government surveys - one of the greatest experiences one could wish for. Here are some travel and leisure experiences to enjoy in the Rocky Mountains of Canada and the USA. Their fangs unto the moon. In the snow-bright, bitter noon. At the clarion call of June. American Spirit Rail rediscovers the Old West: From Montana via Great Falls, Helena, Glacier National Park , Kalispell, Couer d'Alene, Idaho and Spokane to Seattle. America's best daylight train journey. Rocky Mountain House National Historic Park: Talk about thriving on competition; the first Rocky Mountain House was raised in 1799. Weeks later, James Bird, helped HBC erect a rival fort. Explorer David Thompson trekked to the Columbia River from here in 1807, and for generations Rocky was the Northwest's richest fur-producing area. The series of forts that stood on these hallowed grounds are remembered by two stone chimneys. Other exhibits include a York boat, Red River cart and fur press. Ach der leiber! -- did you know that Kimberley is known as Little Bavaria, and is Canada's highest city. Small wonder -- you can get high just breathing the air! With ski runs almost on the main drag, we found ample apres ski time to quaff frosty steins of German lager, gnosh on schnitzel, and sing along to an oom-pah-pah band. On the Platzl, accordionists stroll, midst a scene of gingerbread, gushing fountains, sidewalk cafes and footbridges. Happy Hans, who dwells inside the world's largest cuckoo clock, pops out to yodel on cue. Stop and smell the flowers at Cominco Gardens, or hop aboard the Bavarian Mining Railway. The Spirit Trail: Four mineral pools tumble down the hillside into the Lussier river at Whiteswan Hot Springs, near a lake of the same name. 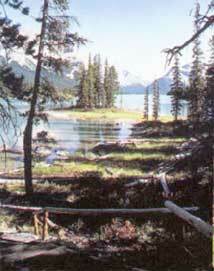 Many First Nations people made pilgrimages to these sacred waters via the Spirit Trail. At Canal Flats, your map shows two mighty rivers flowing side-by-side. Great lovers in Indian folklore, the Columbia and Kootenay Rivers were pledged to remain apart until completing their separate journeys. Kootemik-Radium Hot Springs: Imagine if you can -- two million litters of hot, mineral-rich water gushing from the ground each day. That's a lot of Perrier! With healing powers reputed to relieve arthritis and a list of ailments as long as one's arm, a wily Medicine Man could have made a fortune selling it by the bottle. Known as Kootemik to local Indians, whose legend of Nipika traces their origin, the springs were popularized in the 1890s. At Radium's Aquacourt, you can soak year-round in the steamy, odorless mineral water, or swim in two outdoor pools. The Lodge has an 18-hole golf course, campgrounds and shuttle-bus. Of Marble and Paint Pots: According to experts, Kootenay National Park is an ancient ocean floor. Over 70 million years ago, so they say, it was compressed, folded like a gigantic pretzel, and sculpted into what we call the Rocky Mountains. In 1920, Ottawa bigwigs dedicated the park in a move to preserve the canyon's mineral springs, and protect waterfalls along the highway. 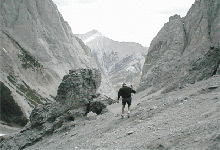 Landmarks on the Banff-Windermere Parkway include Sinclair and Marble Canyons, Vermilion Pass and the Fireweed Trail. Heard about The Paint Pots? Would you believe they're ponds of red, yellow and orange, just like a kiddies' coloring set? The pots are fed by oxide-bearing streams, and there's an endless supply. For ages untold, Indians mixed ochre from this site with fish oil or animal fat to decorate rocks, teepees -- and each other. Near Vermilion Pass, the Alberta- BC. boundary marks the summit of the Continental Divide; rivers east of here drain to the Arctic Ocean or to far off Hudson's Bay; waters to the west flow to the Pacific. Photo: Canyon Hot Springs near Revelstoke, BC. ON THIS TOPICS AS TIME PERMITS.